What is Anterior Head Syndrome? 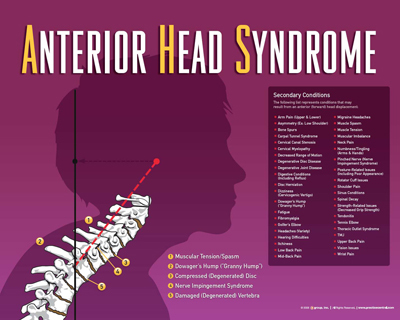 Anterior Head Syndrome (AHS) is when one or multiple Structural Shifts occur in your neck, which causes your head to lose its natural curve and shift forward. AHS, in its earlier stages, looks like a forward slouch, and can develop into a hump. But it is not the look of AHS that matters. What happens when your structure is compromised does. Structurally speaking it can cause disc degeneration and herniation, pinched nerves, spinal decay, bone spurs, etc. When this takes place it can lead to TMJ, carpal tunnel syndrome, migraines, digestive conditions, and much more. The average adult head weighs 10-12 pounds. With every inch your head shifts forward it places about another 10 pounds of pressure on your spine. That would be like carrying a bowling ball on your shoulders all day. Let’s take a look at our phone, computer, television, book, etc. Notice your body position while doing your everyday activities. Being in that sort of position often can compromise a neck curve. In fact, many people refer to this as “Tech Neck” as it results in many secondary conditions like neck pain and headaches. Look at your driving position and how your seat is set. Head rests should be positioned so the top of it is 2 inches above the head (this also helps protect from more trauma in an accident). Your head should be touching the head rest while driving. When at the computer, sitting, standing, running, whatever it is that you do, do it tall. Proper sleeping positions are a must as well. Having the right pillow for your body type is vital to correctly support the structure of your neck. How can we prevent this from occurring when our daily entertainments and responsibilities encourage such poor structure? Awareness and action. 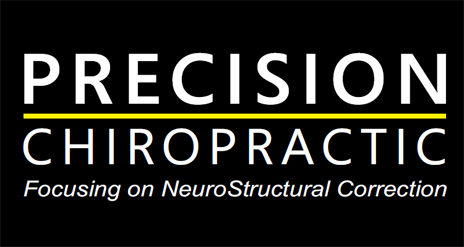 Seeing a NeuroStructural Chiropractor regularly leads to optimum results. By correcting and maintaining Structural Shifts in the spine, you can give your body the support it needs to fully function. To ensure that you don’t undo the corrections performed by your chiropractor follow his/her recommendations. If you need help with finding a structural support pillow or have any questions, feel free to contact us by email (precisionbiddeford@gmail.com) or by phone (207.282.9797) and we can offer you more information.